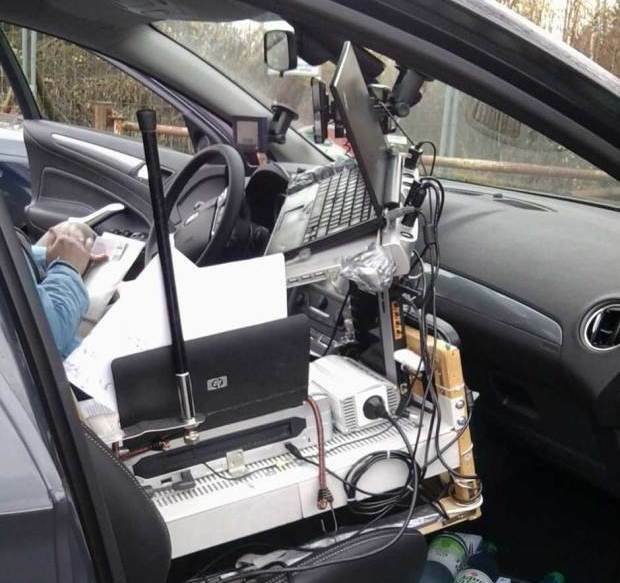 When German police pulled a car over for speeding on the autobahn, they found the driver had an entire mobile office set up in his vehicle. Mounted on a wooden frame in the passenger seat was a laptop, printer, router, wireless internet stick, and WLAN antenna, all plugged into a power inverter. There wasn't any evidence the equipment was in use while he was moving, so the driver only received a speeding ticket. If you thought the interior of that car looked familiar, it's because it looks like just about every police car in America. You probably haven't thought much about it, but distracted driving among police officers is a problem. A Minnesota study found that 14 percent of crashes between 2006 and 2010 involving police vehicles were caused by distracted driving, half of those due to squad car computers.